Designed for use with the Robotic Operating Buddy. 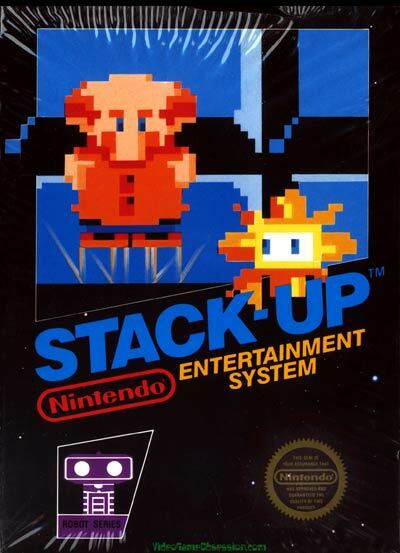 Stack-Up is one of two games in Nintendo's Robot Series, the other being Gyromite. The player begins by arranging the blocks in a standard starting pattern (red, white, blue, yellow and green top-to-bottom on tray #3), and is given a randomly chosen pattern they should be rearranged into by entering commands for R.O.B. one at a time. Once the goal is achieved, the player must press start to inform the game. Score is then calculated based on the time and number of moves taken, and the game moves onto the next phase, for which the starting point is the previous phase's ending position. Phases grow increasingly complicated to execute as the player progresses. Play continues until a block is dropped. The score at that time is the final score, and the player must return to the menu screen by pressing select.